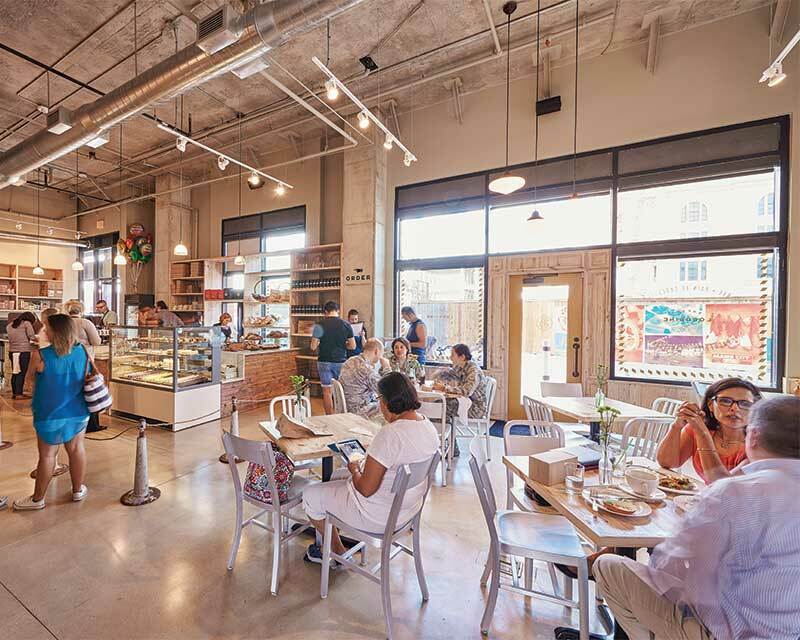 Expansive with high ceilings, light-filled and airy, Bakery Lorraine is much more California cool than you might expect to find in San Antonio’s Historic Pearl District, former site of the Pearl Brewery. Texas sunshine pours through ample windows, the community table is more often than not filled with people chatting or reading or sipping coffee—or a little of all of it. It’s easy to feel at home as the queue leads you past a bountiful case filled with macarons, croissants, cinnamon rolls, tarts, and éclairs. 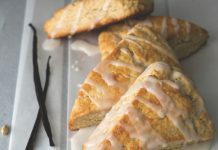 Employees connect with customers as they answer questions about pastries, pull espresso shots, and deliver orders of creamed greens with poached eggs at breakfast or BLTs and chicken potpies at lunch. All of it made by hands that seem to infuse love into each bite. If you’re thinking it sounds a little bit like a fresh-baked-bread-scented dream, it sort of is. 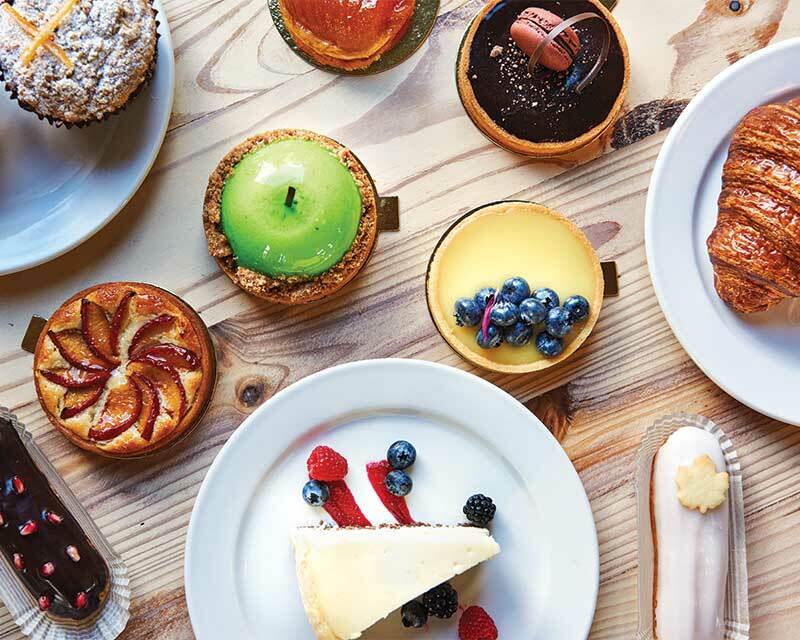 Bakery Lorraine is the result of the collaboration of three people: baking partners in life and work Jeremy Mandrell and Anne Ng, and their business partner Charlie Biedenharn. 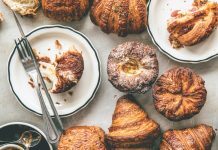 For Jeremy and Anne, it’s as much a happy surprise that San Antonio is where their bakery dream came true as it is to find expertly made Viennoiseries deep in the heart of Texas. While Jeremy grew up in California and Anne in Manila, Philippines, their paths crossed and eventually joined in 2008, when they were both pastry cooks at Thomas Keller’s Bouchon Bakery in the Napa Valley. They worked the night shift together baking through the wee hours, bonding over dough as the bread came out of the oven and “sang” (crackled as it began to cool). They both loved the intense work, witnessing the transformation of flour and water into bread, working precisely with chocolate, laminating dough, or piping just so. It was behind-the-scenes, deep-in-the-night sort of work. It was away from the hustle and bustle of the daytime rush, but still intensely focused. They worked, they talked. They fell in love. Their life was baking. They talked of baking dreams, but the work was grueling and hard, even if they loved it, and it didn’t pay a lot. When the economic downturn happened later that year, it seemed their dreams of one day opening a bakery were far fetched. And, they were tired. Maybe that “baking phase” was over. Jeremy had family in San Antonio who convinced him to move and accept a position at a tech company. Anne soon followed. They went corporate during the daylight hours, but nights and weekends, still baked for fun. When they replaced their apartment dining room table with commercial kitchen speed cooling racks, Jeremy and Anne knew that this was more than a hobby. Baking was still in their hearts. They secured a stand at the since-closed Quarry Farmers and Ranchers Market, and they would bake all night to have fresh goodies for the weekend market, often meeting a line when they got there and selling as fast as they could unpack. When the couple met San Antonio native Charlie Biedenharn in 2011, they found a partner in their pastry plans, and Bakery Lorraine was born. 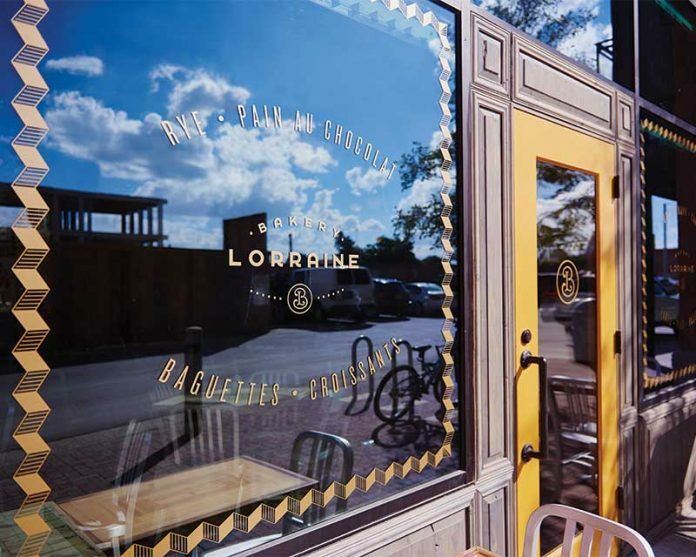 While a lot of San Antonians might be first introduced to Bakery Lorraine through the ever-rotating selection of pastel-colored macarons—the bakery creates 1,500 a day in flavors such as Rose Pistachio, S’Mores, Earl Grey, Lavender, and Blackberry Cardamom—the bakery’s sweets roster goes much deeper. Everything is made by hand with deft precision and shared with an easy generosity. Take for instance, the canelé, a pastry that’s notoriously finicky to perfect, with its crunchy exterior and custard center. It is often overlooked by the casual bakery visitors who flock to the easily recognizable croissants and éclairs. But Jeremy has made it his personal mission to introduce San Antonio to the canelé. He’s so invested, he regularly offers free samples to customers. For each batch of the canelé, the bakery team at Lorraine lines individual copper molds with a thin coating of beeswax from Gretchen Bee Ranch in Seguin, about 45 minutes east of San Antonio. 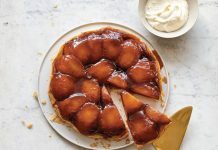 As the pastry bakes, the beeswax melds with a mixture of eggs, sugar, flour, and rum (or vanilla) to create a silky custard center with a fluted caramelized exterior, a robust contrast to the pastel tones of the airy macarons.